How's everyone? Hope all is well with you dear readers. Actually, I'm still on a post-wedding high as I write this. But admittedly, I'm pretty occupied with so many other things that I only get to write my thoughts about the wedding and the life after being married, just now. Sometimes when I think too much about what first to write, I panic. There are so many good things to write about, so many wonderful stories behind the wedding preparation to share, that I don't know where to start. So I decided, to skip the chronological of what to write in my head, and just go with the flow of what's in my heart. So, I'm now a Mrs! Woohoo! Thank you to everyone who sent their congratulations and well wishes to me and my husband. Whoa! That actually felt great! Hahaha! To call Macky, my husband and it's legit. I'm giddy about that thought. It's been ages since we lived together without the blessing of marriage. I'm not proud about it but I am not hiding that part of my life to anyone. If you've been following my life story which I briefly shared on the blog, you'd know that I was annulled from my previous marriage. So jumping into another one, even if Macky and I have been together for years, scared the hell out of me. He asked me for marriage four times and I didn't say no, but I didn't say yes either. When he popped the question the first, second, and even the third time, I was paralyzed each time. The only answer I gave was "Can we talk about it first?" Buti na lang on the fourth and last time, I felt that I was super ready for this married life and I finally said YES. Otherwise, I think iiwan na niya ako! Hahaha! I'm happy he stuck around and patiently waited for the right time. Ika nga ni Lola Nidora, "Sa tamang panahon." November 28, 2015 - the happiest day of that month (I honestly couldn't say of the year, because there are just too many happy moments this year for me and the family). 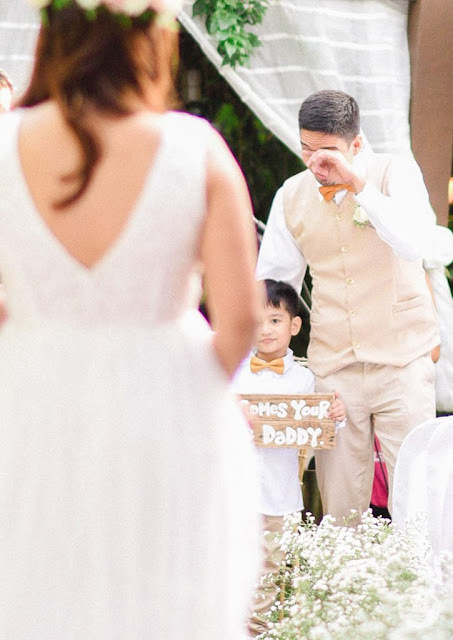 I didn't expect that my husband would cry while I walked down the aisle. The sun was shining mighty high. It rained in Metro Manila but not in Antipolo. My prayer for a zit-free day was also answered. 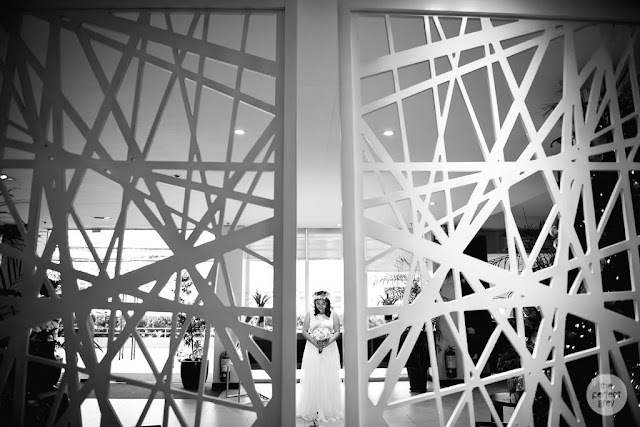 I prepared everything well a few months before the wedding, and all my pegs were achieved and my plans were executed exactly as how I envisioned it to be. I prayed for a chillax day for me and Macky, and yes, we both had that relaxed and fun vibe even if we had to go to pick up my flowers from Dangwa in the morning, go to the venue to style it ourselves, and even if I had to sew additional ribbon on the DIY wedding ring pillow in the car on our way back to the hotel. We had a fun "production" day and all the DIY-back-aching-days paid off. We were both pleased with how our wedding turned out. Simple. Practical. Intimate. Happy. Our wedding theme was Rustic Shabby Chic. I got a lot of ideas and inspirations from Pinterest. That's why, I really LOVE Pinterest because it's a life-saver for people who want to save a lot by going for DIY instead of having stuff made by other people. I still couldn't believe we pulled our DIY projects off (which by the way I'll also be writing about in the coming posts!) Basta, all I can say is, Pinterest has made our wedding Pinterest-worthy. We requested our guests to use the hashtag #MackyLouiseFinally when posting photos on social media. You may check it so you could see some photos of the wedding. The hashtag is so apt because, FINALLY, kinasal na talaga kami. How's life after the wedding? Blissful and BLESS-ful indeed! 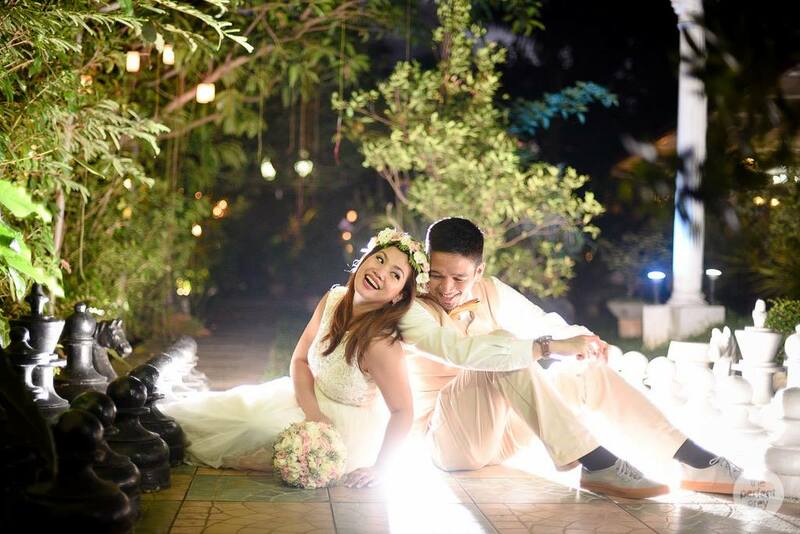 Iba pala talaga ang feeling when you're married with the person God gave you to spend the rest of your life with. The wedding ring, which at first I thought Macky would lose in a week, in fairness, he feels incomplete when it's not on his finger. Oh, and if you're curious about the budget, all I can say is, the cost of our car down payment is bigger than what we spent for the wedding. I'm not called Mommy Practicality for nothing diba? Practical and blissful wedding indeed! That's how we envisioned it to be. Macky made these signage. "Better Together" is our theme song (by Jack Johnson). The song tells so much about us as a couple and it was also my wedding march song, which unexpectedly I cried to. Happy feels! We haven't gotten into the best part of my story! Two weeks before the wedding, Macky and I found out, that we're expecting our THIRD CHILD! And we announced this wonderful blessing to our 70 pax guests (immediate family, very close relatives, and friends common to both) during our wedding, exactly during Mac's vow-reading. This pleasantly surprised everyone, who wouldn't be? It was a happy moment talaga for us! A week after our wedding, BOOM, my baby bump was shouting to the world already. I'm 12 weeks on the way, officially ending my first trimester! The best family photo of the year! Double blessing. Double Happiness. That's how I would best describe my wedding and sort-of unexpected pregnancy (but strategically planned to have it after the wedding). But God has better plans! He wanted to give our gift earlier and I tell you, His timing is always perfect. This baby has saved me more than once in the most perfect time! Now, I'm a happily married woman! Naks, nakakakilig pa rin talaga! 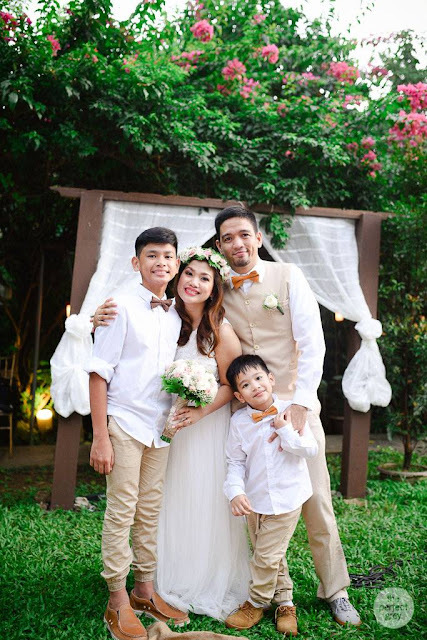 I promise that I'll be sharing more stories about the wedding which will surely help a lot of other aspiring mommy-brides like me. As I keep on saying, God is a forgiving God and a God of second chances. He gave me my second chance when He thought I needed it. Then He gave me this wedding and blessed it with so much ease in preparation, budget and actual execution, all in His perfect time. My wedding is the most perfect wedding I've been to, because it's ours of course! :) I'm sure by now, you could sense that I'm smiling while daydreaming about what happened during our wedding and telling you my story. Yes, that's how happy my wedding was. This is my wedding story. More to come loves! Again thank you for your warm greetings and joyful congratulations. Have a good day ahead! Congratulations! Your wedding looks beautiful! Grabe! Nakakaiyak! Congratulations, Louise and Macky!!! You had such a beautiful wedding and I'm certain your marriage will be one that's full of love! Best wishes! 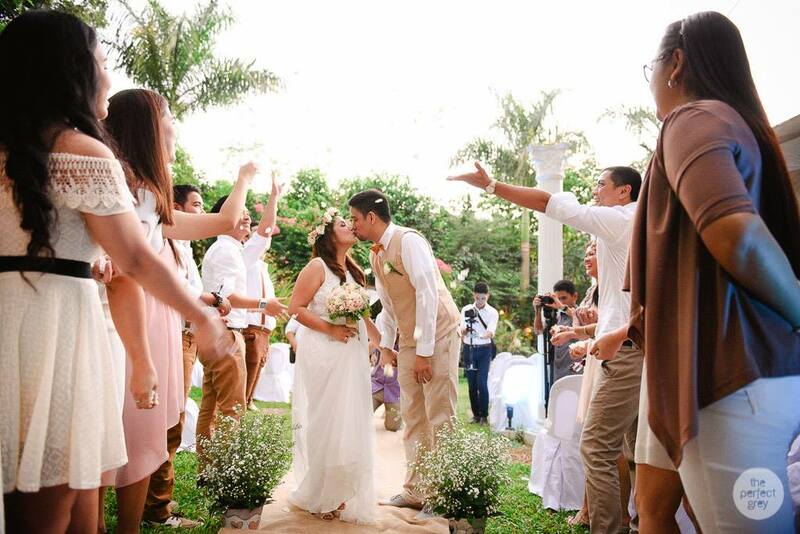 So happy for you,Louise and Macky! Congratulations!!! Wow... super happy for you Ms. Louise.. 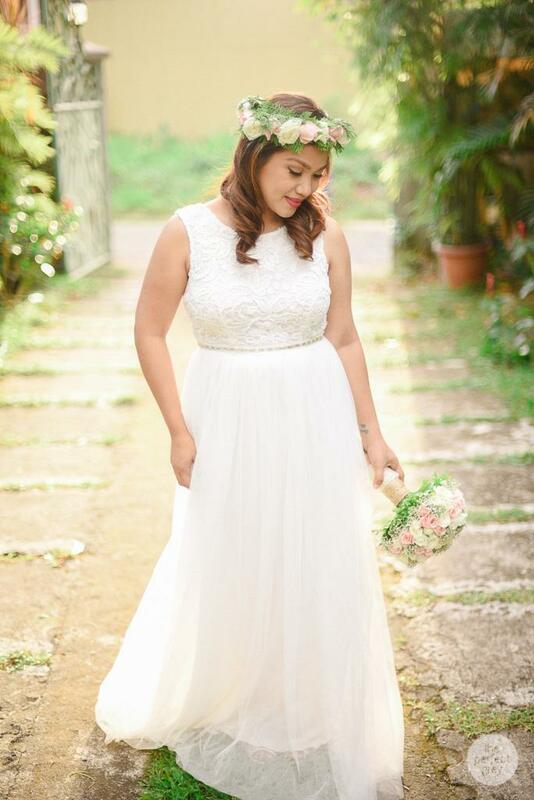 I've been checking ur blog almost everyday kasi I'm that too excited to know how ur wedding day went. Plus "may baby bonus pa.. God bless u and your family! Thank you @MommyCharm! Yes, it was a small wedding of 70pax only, yet, it was heartfelt and super happy. :) Thank you! Thanks Jenny! :) Finally I found time to write. Grabe busy kasi sa work. But I have so many things to share din kasi talaga! 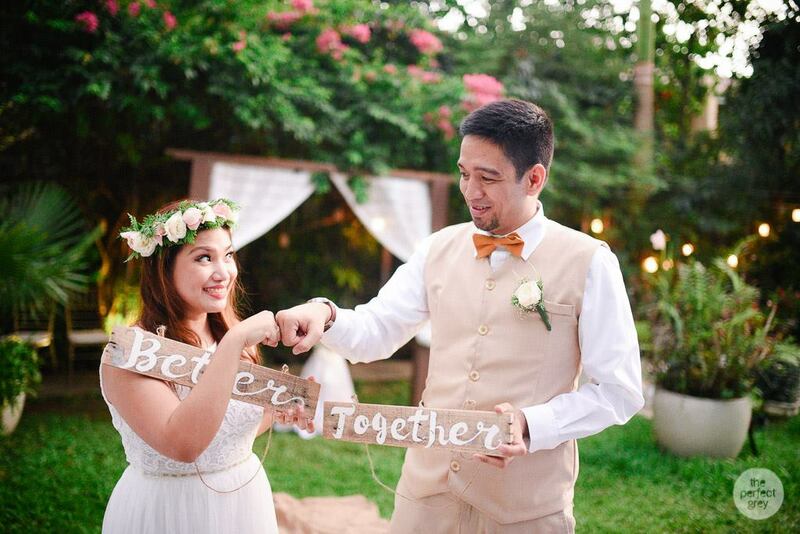 :) Go check lang in a few days for updates on the wedding suppliers, preps and DIY projects! :) Thank you! Hahaha! Thanks @sairiel! :) Go get married, basta with the right person ha?! :) God bless! Juicecoloured, sorry just replied today. THANK YOU SO MUCH for your well wishes!!! :) Huuugs! Hope to see you again soon! Many many thanks Nerisa!!! :) Huuuuuugs! hello Louise! thank you for your blog it was so lovely! i just want to ask if how much yung bridal bouquet mo? great!did you ordered it at dangwa or somewhere else po? Hi how much ngastos mo sa venue? Cnu ngsetup ng theme.? Un sa caterer b? Hi Kat, venue was discounted, 20K (free use of house sound system, electricity, house lights) and the theme was all my idea, executed by my caterer. :) Thanks.